With perhaps only 500 Poweshiek skipperlings left in the world, the Manitoba Tall Grass Prairie Preserve is giving this endangered butterfly a chance to survive the odds. On a sunny November day, Marika Olynyk checks the temperature above and below the snow at the Manitoba Tall Grass Prairie Preserve, just 80 kilometres southeast of Winnipeg. “Oh, that’s interesting,” she says. “It’s nine degrees warmer under the snow, close to the ground.” The site is home to some of the world’s last Poweshiek skipperlings, an endangered butterfly species currently in diapause — the insect equivalent of hibernation — and protected from the cold under a quilt of snow. “We think they’re near the soil. Some insects go into the soil in winter, but we don’t think the Poweshieks do that." The “we think” is important. 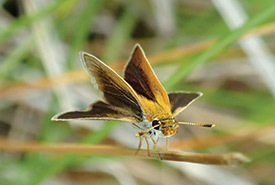 In the entire world, perhaps 500 Poweshiek skipperlings are left, with a significant portion found at the Manitoba Tall Grass Prairie Preserve. Once a common species, they’ve now become exceedingly rare: 10 per cent of the world’s population may be lying, frozen, a few feet from Olynyk’s weather monitoring station. Over the past 20 years, the population took a sharp, worrisome nosedive. Determining why the butterflies have disappeared, and how they can be recovered, is a team effort that stretches across the Canada–U.S. border. It requires universities, zoos, governments and researchers, including the Nature Conservancy of Canada (NCC), to pool their knowledge, filling in the questions on this understudied species. “That’s the problem with endangered insects: they’re not on anyone’s radar. They’re fascinating if you see them up close, but no one’s going to see them up close,” says Olynyk wryly. She grew up in the country outside of Saskatoon, surrounded by nature — from the toad that came out of the sandy soil to plop onto the family’s deck when it rained, to the prairie cactus she loved showing off to a visiting relative. Passionate about ecosystems, Olynyk originally studied environmental science, before earning her master’s degree in natural resources management. Now an engagement coordinator in NCC’s Manitoba office, her work includes research on the Poweshiek skipperling. “They’re not as charismatic as panda bears or polar bears, although those are great for drawing attention to environmental issues.” It’s also easy to admire butterflies like monarchs, those magnificent long-range flyers found across southern Canada. But it’s perhaps less easy to admire the small, drab-brown Poweshieks, which are born and die in the same small patch of prairie. Today, the most urgent conservation action for species at risk, like the Poweshiek skipperling, is to protect and restore their habitats. Once common across the American Midwest and adjacent Manitoba, Poweshieks are now found near Flint, Michigan, possibly in Wisconsin and in one place in Canada: the Manitoba Tall Grass Prairie Preserve. The preserve is over 12,000 acres (4,800 hectares), and owned by NCC and other partner organizations. The wind blows across flat, scrubby fields, interrupted by woods of bur oak and aspen. Here and there are old tractor attachments, abandoned by settlers who tried to grow crops, only to find the soil better suited to raising cattle. Ranchers and farmers conserved the native prairies in the area through grazing, haying and pasture-rejuvenating fire, to the delight of botanists who went looking for examples of tall grass prairie a century later. 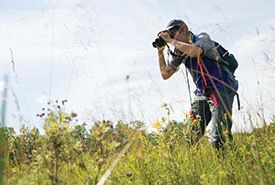 Established in 1989, the Manitoba Tall Grass Prairie Preserve is home to 16 species at risk, including two endangered butterflies: the spectacular monarch butterfly and the drab Poweshiek skipperling. With close to 200 Canadian species at risk documented on its properties, NCC is actively working to protect and recover these species. NCC also manages and restores habitats for species at risk on some properties, with activities such as prescribed fires and invasive plant control. NCC also works with local conservation groups and other landowners to develop management plans for properties. In the Manitoba Tall Grass Prairie Preserve, for example, cattle grazing and haying the grasses can help maintain open grasslands, benefitting the health of the prairie and local economy alike.